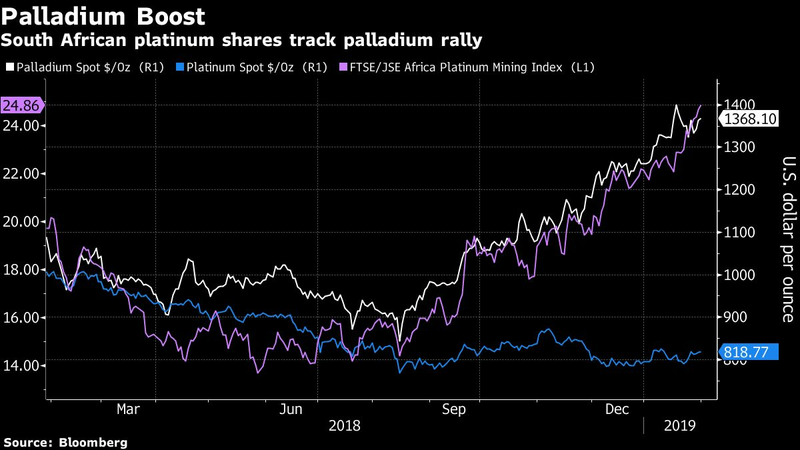 For South African producers, the rally in palladium is partially offsetting the slump in platinum prices to near a decade low. Combined with a decline in the rand, which lowers costs for miners selling metal for dollars, that’s extending a lifeline to companies such as Impala Platinum Holdings Ltd., Sibanye Gold Ltd. and Lonmin Plc. The price of palladium, used mainly in pollution-control devices in gasoline vehicles, has almost tripled over the past three years, including a 41 percent gain since August. Rhodium, another byproduct of platinum mining that’s used in cars and the chemical sector, has climbed fourfold since July 2016. Smaller quantities of the other platinum-group metals — iridium, ruthenium and osmium — are also extracted from South African mines. Implats rose the most in more than two months in Johannesburg trading on Monday after the world’s No. 2 platinum producer rebounded to a first-half profit from a year-earlier loss. The turnaround was driven by higher platinum-group metals prices, the company said. “We have customers asking to buy all our palladium and rhodium,” Johan Theron, a spokesman for Implats, said before the results were released. That demand doesn’t fully compensate for losses from mines that produce mainly platinum, he said, and the company still plans to cut 13,000 jobs at its giant Rustenburg complex. Anglo American Platinum Ltd. said on Tuesday it expects 2018 profit to as much as double, boosted by a 13 percent increase in the basket price of PGMs. The world’s biggest platinum miner is also expanding its Mogalakwena mine that is highly geared toward palladium. The importance of palladium varies between different mines and producers — accounting for about a quarter of Lonmin’s platinum-group metals output and about half that of Sibanye, following its purchase of U.S. palladium producer Stillwater Mining. The surge in palladium is helping Sibanye pay down debt it accumulated during an acquisition spree, said spokesman James Wellsted. The basket price for the company’s output of all PGMs surged 19 percent to 15,700 rand ($1,155) an ounce in 2018. High palladium prices as the market remains in deficit until around 2024 may eventually encourage automakers to switch to platinum, which is currently largely confined to diesel cars. That would provide a further boost to South African producers, said Morgan Stanley analysts including Christopher Nicholson. While the rand has surged this year, it’s still down almost 10 percent against the dollar over the past 12 months. Should the currency weaken again, that may allow Implats and Lonmin to postpone some of their planned job cuts, said Rene Hochreiter, an analyst at Noah Capital Markets Ltd.